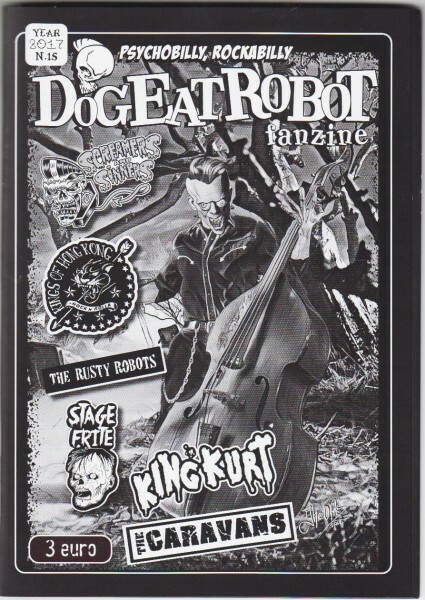 Produktinformationen "DOG EAT ROBOT Fanzine #15"
DOG EAT ROBOT Fanzine# 15! What is there to say about this new and whopper edition? Browse through it, after carefully washing your dirty hands, in this new edition you will come across a fiery interview with Smeggy, engaging frontman of the legendary and pioneering King Kurt!!! Immediately after that Mr. Mark Penington from legendary rockers The Caravans presents us with the new EP from the English trio "If It Ain't Broke" for Western Star Records, we love it! Then we'll talk with the Stage Frite, a Psychobilly band that have come back alive after the limbo that swallowed them after the early 1990's ... the band have been back in the recording studio with the tireless Alan Wilson and produced a new and powerful album titled "Scarier Than Swans", that is great !! You will then come to the German trio The Rusty Robots who will present us with their Old School Psychobilly sound seasoned with so many new wave shades !! We didn’t miss the opportunity to feature the Spanish band Screamers and Sinners who have just released their second album, this time produced for the fantastic Drunkabilly Records and we've had a chat with the mysterious Kings Of Hong Kong talking to them about the promotion of their second and fantastic studio album "Strange Thing" an LP full of rock'n'roll, garage and wild rockabilly. Aren't you still not satisfied? Well, then you just have to get some laughs reading the crazy experiences on tour from two young but already affirmed bands, German rockers The Minestompers and New Yorkers The Spastiks !!!! We have left the cover space to an old friend ... who has already made the graphics for our past Issue # 4 in 2013! So we can only say Thanks again to Mr. O'Prez for his enormous and stunning contribution to the graphics! Weiterführende Links zu "DOG EAT ROBOT Fanzine #15"
MEMPHIS MORTICIANS - Dial M For Mortician LP ltd.